Permalink: When is your hearing going to go bad? They treat me like a fly in potato salad. Permalink: They treat me like a fly in potato salad. Permalink: Is this where birds stay when they go to Vegas? It's not a hobby, dear, it's a symptom. Permalink: It's not a hobby, dear, it's a symptom. Beverly: You've been grocery shopping for seven hours. What took you? Permalink: One day you'll have a brownie in college and it will make it even better. Dan: How much would you say you eat a week? Mark: Say whatever you have to, to get me in. Permalink: Say whatever you have to, to get me in. Permalink: We each get her for a week. Jackie: I will take Darlene and her kids. Roseanne: No, I like one of those kids. Permalink: No, I like one of those kids. Permalink: I'm older so I hated her first. 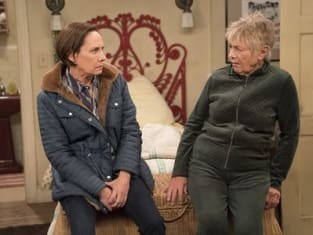 Roseanne: You gotta take her. Jackie: No, not a chance. Possession is nine-tenths of the law. Permalink: No, not a chance. Possession is nine-tenths of the law. Permalink: Would it be rude of me to take my coffee in my room?